Slowly but surely, the grass is greening up in our lawns and that means just one thing. It’s time to get a jump on lawn care before it gets away from us. First, if you have crabgrass issues, apply crabgrass pre-emergent granules now. Marketed under several trade names, this chemical creates a barrier on the soil surface that kills any emerging crabgrass shoots. Once the shoots are up and growing the only way to get rid of them is to sacrifice the grass and kill everything off. This might work for small patches but if the whole lawn is involved, that is a whole different issue. Now is the best time to aerate your lawn with a core aerator. Available from local rental companies or lawn service providers, a core aerator pulls 3-inch plugs of soil out of the sod and leaves holes behind. The holes allow air, water and fertilizer to get deep into the roots which creates a much healthier lawn. If your sod is compacted or you haven’t aerated in a while, plan on aerating again in the fall before you put your last application of fertilizer down. There is no need to rake up the soil plugs left behind. They will disintegrate over the spring. It is not necessary to thatch lawns here as we don’t have the buildup of dead grass found in other parts of the country. Thatching tears up the grass plants just as they are beginning to grow which weakens the sod in the long run. Aerate instead. What dead grass there is breaks down quickly and adds organic material to the soil. The two most important fertilizer applications for lawns are in the spring and the fall. Apply a slow release fertilizer around mid-April. The slow release fertilizer will release nutrients at a rate the grass plants can use effectively. 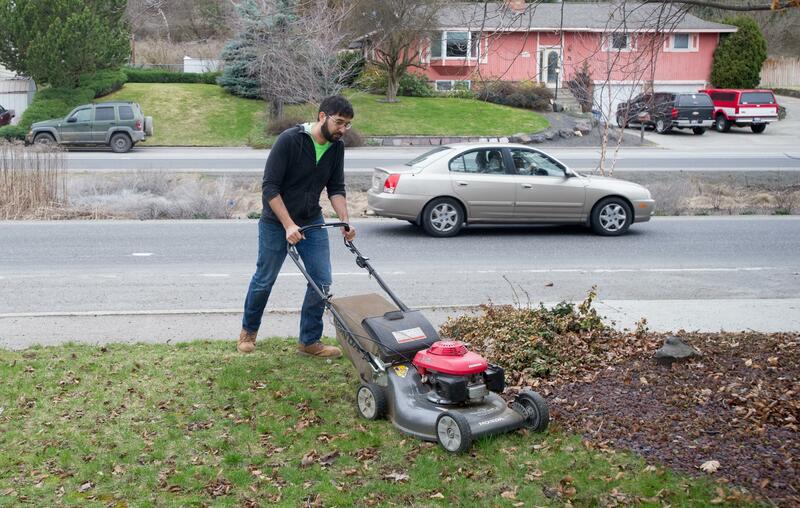 The result is a slow greening of the lawn and a manageable growth rate. Fast-acting fertilizers green up a lawn in a matter of days but result in fast growth that the roots can’t keep up with. Shallow-rooted grass plants are more prone to heat stress later in the summer. Healthy lawns are a medium green color, not a deep dark green. Make another fertilizer application around Memorial Day and then again in early September. Once it gets hot in July, most lawns go dormant and can’t use fertilizer. The weeds will be coming up right behind the lawn. Rather than using a weed-and-feed-type product, spot treat weeds with the appropriate herbicide. Weed and feed products might be convenient, but they apply more herbicide than is needed. That excess can lead to ground-water contamination. When you use herbicides, always follow label instructions and store garden chemicals safely. Get your mower blade sharpened properly and cut the lawn between 2 and 3 inches tall. This leaves enough grass leaf to support strong roots and shade the lawn when it gets hot later. Taller grass shades the soil and reduces water loss. Published: April 11, 2019, 5 a.m.